I don’t understand anyone who doesn’t like chocolate or peanut butter. But if you do, you’ll love this cookie. Not only are the chocolate and peanut butter mixed together, you get an added zing of peanut butter when you bite into it. 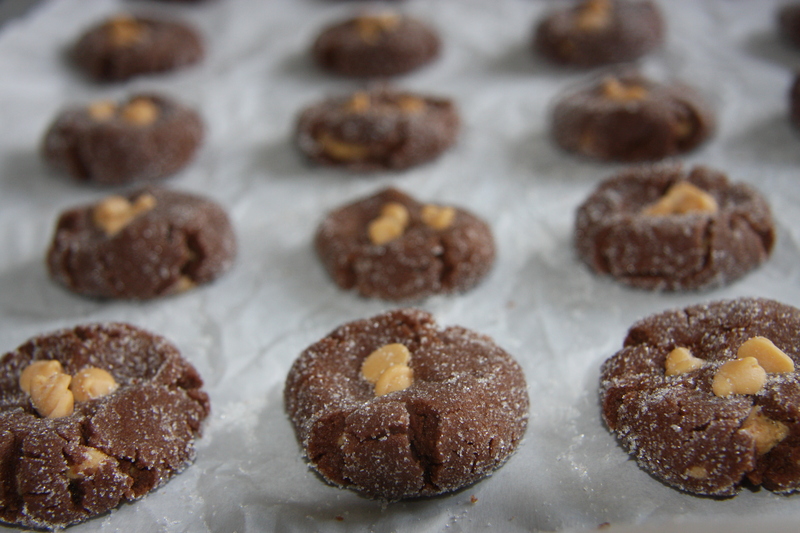 Finding this recipe on a blog called My Simple Kitchen I haven’t looked back since.I love, love, love chocolate and with the combination of peanut butter your transported into heaven. I don’t know of anyone else who can sit down with a jar of Nutella, a spoon and have a feast. That is my one treat when away on holidays and that is exactly how I eat it. My husband just cringes and asks me how I can eat it like that. Not hard. 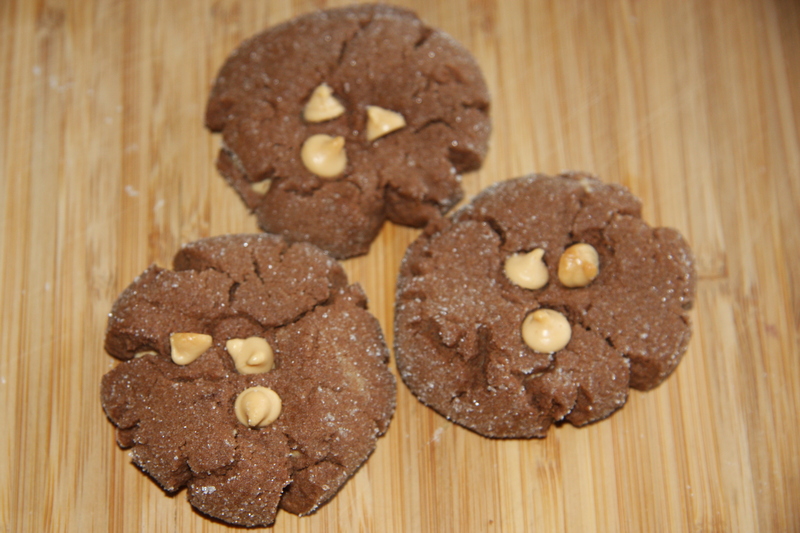 So if you like chocolate and peanut butter please try this recipe. 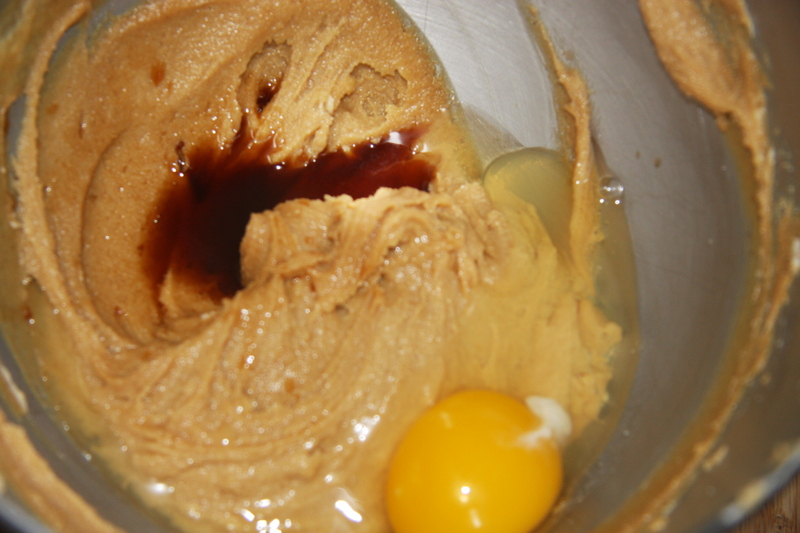 Into a mixing bowl beat together 1/2 cup brown sugar, 1/2 cup white sugar and 1/2 cup of softened butter. Next add 1 whole egg and 1 teaspoon of vanilla. When this is all blended together add 1/2 cup of cocoa, mixing well. Then add 1 – 1/2 cups of flour, 1/2 teaspoon baking soda, 1/4 teaspoon salt again mixing well. Set aside. 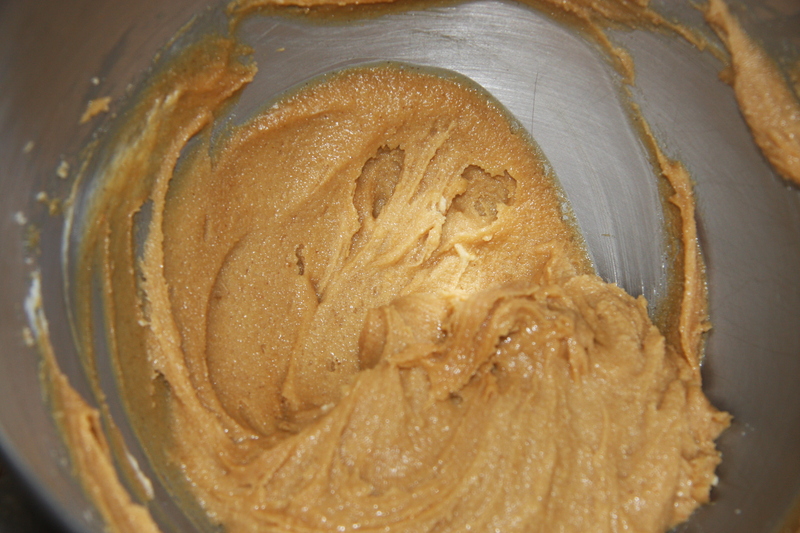 Into a medium mixing bowl add 3/4 cup of peanut butter and 3/4 cup of icing sugar. Mix well. 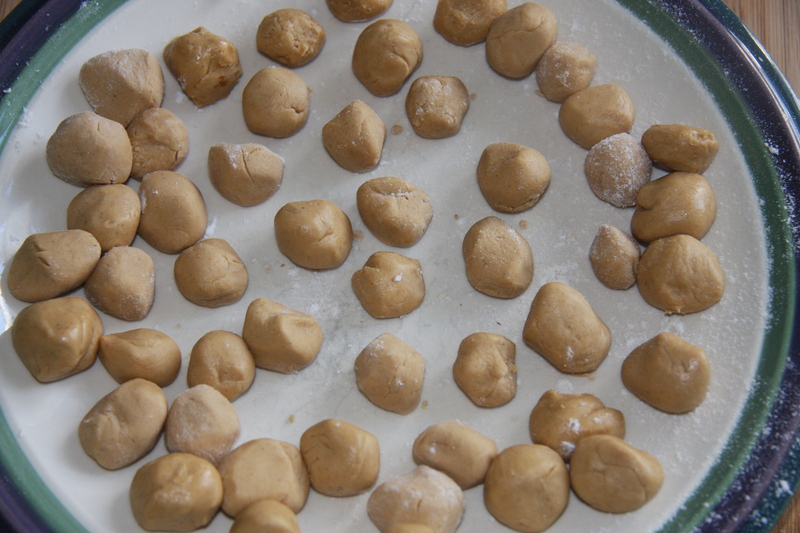 Then I take all of the peanut butter dough and roll it into little balls. 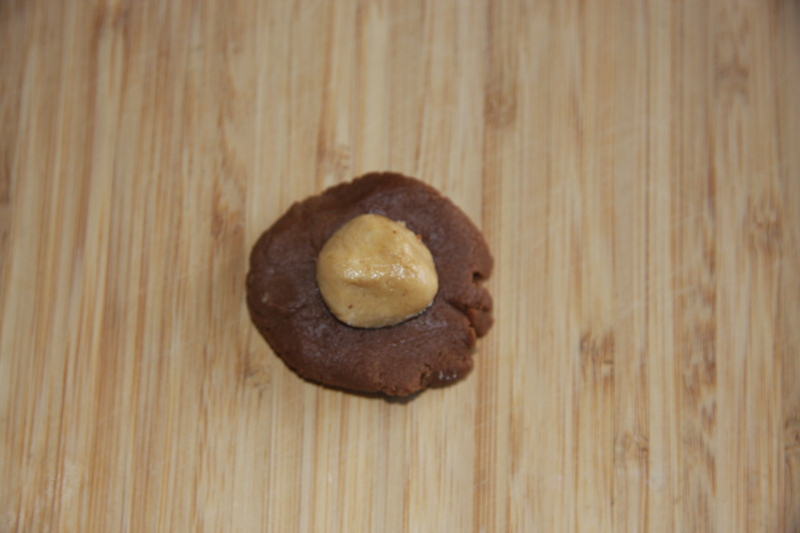 I eyeball some of the darker dough, roll it and press it to form a circle, placing my peanut butter ball on top. Gently pressing the edges together and rolling it in between my hands again. 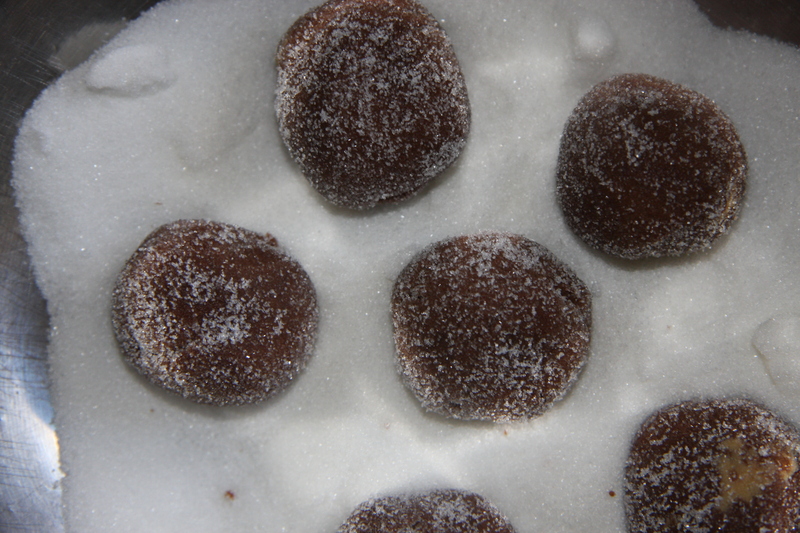 Drop the chocolate balls into another bowl with 1 cup of sugar. Roll them around until they are coated with the sugar. Onto a baking sheet lined with parchment, place the ball about 1 inch apart gently pressing them down. The edges will crack. But that is the rustic beauty of these cookies. On top place 3 peanut butter chips. Bake in a preheated 375 degree oven for approximately 10 minutes. Your house will smell sssooo good. These freeze well. A great treat with a cup of coffee or a cup of tea. Into a smaller bowl, mix together 3/4 cup peanut butter and 3/4 cup icing sugar until well combined. Eyeball little pieces and roll into tiny balls. Repeat until this mixture is all used up. Into another mixing bowl cream together 1/2 cup brown sugar, 1/2 cup white sugar, 1/2 cup unsalted butter, 1/2 cup peanut butter. Beat in 1 teaspoon vanilla and 1 egg. 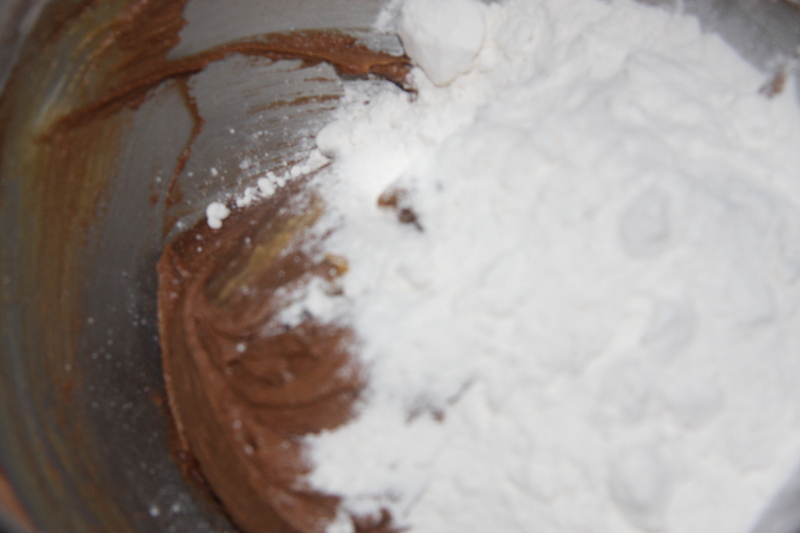 Next add 1/2 cup cocoa powder, 1-1/2 cups flour, 1/2 teaspoon baking soda and 1/4 teaspoon salt. Beat until all ingredients are well combined. It will be a little crumbly but just press together and roll between your hands to form a ball. Flaten and then place the little peanut butter ball on top, gently fold and seal edges and then roll again to get a nice round shape. Place the ball into a bowl of sugar and proceed to coat it. Place onto a parchment lined baking sheet. Repeat until all the dough is used. I did have some of the peanut butter balls left, so I placed them into a zip lock bag and put them into the freezer. They will come in handy for something else.